← May Movie Night for compost month – Dirt! Last Thursday I was once again a guest of the East Metropolitan Regional Council (EMRC) with another information session for their proposed WWTE Plant in Hazelmere. Previous attempts to woo the public have failed, resulting in the EMRC being forced by the Environmental Protection Authority (EPA) to carry out a full, Public Environmental Review (PER) of the project. This time around was a little different. Previously the proposal was to build a Pyrolysis plant yet now there is no mention of the term “pyrolysis” in the promotional literature. Confusingly, this isn’t the first name change for this type of operation. Back in the days of “plain-speak” they were called Incinerators. When that term (and the air) became toxic to the public they were renamed as Pyrolysis Plants (based on the technique of heating materials in the absence of oxygen). After another public revolt it has been repackaged as WWTE, or Wood Waste to Energy. On the surface, the PER document is relatively inoffensive. It reads more easily than the previous version although you still might need a degree in chemistry to fully understand it. The proposal seems to be rational and well argued. The EMRC has a vast stockpile of wood waste, mainly from building projects that it wants to “recover” the energy from by cooking it in a kiln and then using the gasses generated to run gas turbines that will then generate electricity. Scrubbers in the smoke stack would extract almost all of the toxins generated and several thousand houses would receive Green electricity from a renewable resource, a resource that would otherwise be dumped in landfill. As usual, the sting is in the fine print….or the bits that didn’t even make it in to the fine print. The EMRC had promised residents some years earlier that they would not build an incinerator in Hazelmere. The EMRC now claims that this is not an incinerator as it does not burn or combust material: it gasifies it. This really is a matter of semantics. The process heats wood to around 600 degrees in the absence of oxygen, producing a flammable gas that is then combusted (aka incinerated) in a gas turbine. Even though it is a two stage process it still means that the wood is burnt/combusted/incinerated. The EMRC has indicated that they have a “large existing market for wood chip fines and a smaller market for wood chip”. At the meeting a commercial chicken grower spoke effusively about the value and quality of wood fines (the finer particles after the wood stock has been ground) supplied to his business by the EMRC. My understanding is that it is the coarse chips which the EMRC is having difficulty selling. A logical step would be to run the coarse chips through the grinder a second time, thus generating more fines to fill the “large existing market”. There are also many other uses for the coarse wood chips. These include chipboard, structural beams, mulch, and soil stabilisation. Despite all this, EMRC Chairman Alan Pilgrim is quoted in this week’s Echo Newspaper as saying that there is no market for shredded wood and that if the plant did not proceed then the only alternative was landfill. This burn or bury policy is a tragic indictment of the EMRC and a far cry from the reuse/recycle policies it once championed. It is a requirement of both the EPA and Waste Authority that the waste sourced as input for waste to energy plants must target genuine residual waste that cannot feasibly be reused or recycled. 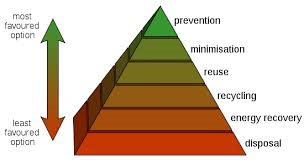 The EPA and Waste Authority support the Waste Hierarchy which classifies the treatment of waste from prevention as the most desirable down to dumping in landfill as the least. Waste Hierarchies usually look like variations of the one shown below. Energy recovery is the process being touted by the EMRC. This is one of the least favoured options because it destroys the resource so that it can never be used again. The EMRC states that they have carried out detailed modelling of air movements and air quality to ensure the safety and wellbeing of those living around the plant. This is in fact true…..except that they did the modelling at their Red Hill site, a breezy area on top of the Darling Scarp, surrounded by bushland. Red Hill is 16 Km from Hazelmere which is located on the Swan Coastal Plain, has dense residential housing, and has frequent temperature inversions in winter which trap and concentrate pollutants at ground level. Illogically, the EMRC believes that air movements in Hazelmere will be the same as they are at Red Hill. Their unwillingness to carry out a detailed local study implies just how little the EMRC cares about the health of Hazelmere residents. Hazelmere and surrounds already bears a large burden of polluting industries in the form of several brickworks, plasterboard manufacturers, and a rendering plant, not to mention the significant flight path from Perth Airport. When introducing any new polluting industry to an area it is important to assess what is already in the air so the cumulative effects are known. But the EMRC report states “The project timetables have not been sufficient to enable background air quality data to be obtained at the specific proposal site”. Local residents should not be exposed to risk simply because the EMRC has not allotted sufficient time to assess the air pollutants and the damage which they might incur. There are a raft of other inconsistencies in the report and presentation from a lack of detail on how feedstock is going to be sorted to avoid contaminants to the ease with which feed for the plant can be changed from clean wood to mixed waste with a works application to the EPA. The EMRC asks us to trust that it will act in our best interests however they seem to have no interest in earning that trust by being forthright, clear and thorough in planning this project. Many residents in Hazelmere, Guildford, Midland, South Guildford, Bassendean and Woodbridge are just sick of being used as a dumping ground for the waste and excesses of the rest of Perth. Yes, we are all part of the problem when it comes to generating waste. Sadly, the imagination of the organisations that we employ to manage this waste can’t seem to stretch beyond the idea of Burn or Bury. If you feel that it is not appropriate for this plant to be built in Hazelmere then you can lodge a submission with the EPA regarding this through the same web page. Submissions close on 3 June, 2014. This entry was posted in Community, Energy, Environment, Take Action, Waste & Recycling and tagged East Metropolitan Regional Council, emrc, Hazelmere, Pyrolysis, Wood waste to energy. Bookmark the permalink. I have seen one of these plants in operation in Oregon at the beginning of September. I was amazed to learn that there was no smoke or any sign of any emissions. I can send you photos of the plant in operation.